Hello again! Your presence on this page implies that you’re really keen on giving your troop the best-in-class business chat app in the form of Troop Messenger! Let’s not waste more of your precious time and talk business. By now we hope that you have a fair idea of the basic features of the Troop Messenger. Today we’ll discuss its excellent customer support service. Any decent company that develops top-notch software should definitely have a webpage where it has answers to all Frequently Asked Questions by the user. The number of questions in that section shows the company’s research and thoughtfulness in developing the software. Desktop Features, which talks about the features of Troop Messenger’s desktop version. 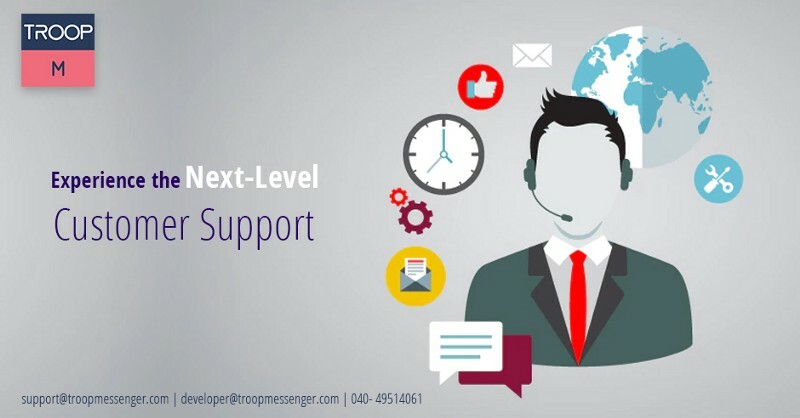 If you can afford some time to go through the aforementioned FAQ sections, you will amass a wealth of knowledge about Troop Messenger. If you’re one of those who loves a prelude to a story, please feel free to visit this page. Besides its support in the form of email and voice, Troop Messenger also offers its users to share their feedback. Currently, this feature is available only on the mobile app. To send a feedback to the developers of Troop Messenger, click on the top right corner of your screen where see three dots. From the drop-down menu, select “Feedback”. You will see a window that will ask you to choose a type, which has four options: Bug, Feature, Suggestions, and Other. Select the type that best describes your feedback. Then type your concern or problem and click on the send button. You can also upload an image of your problem for a better understanding of Troop Messenger’s support team. That’s all for now! But do visit the page again for more features about Troop Messenger. And don’t forget to share your feedback about Troop Messenger with us.